Rising Ape Collective and award-winning game developer Alistair Aitcheson team up to bring you a night of playable and improvised comedy like nothing else on stage. Publish or Perish is the choose-your-own-adventure from Rising Ape where the whole audience gets to play together. Take control of a young scientist trying to make it through the strangest day of their life, guided by the all-knowing game master. Mashing up daft songs, live action role play, deadly punning photocopiers, a lab full of improvisers and an unhealthy dose of audience suggestions, surviving the sci-fantasy world of Publish or Perish ultimately depends on your choices – democracy taken to the next level! 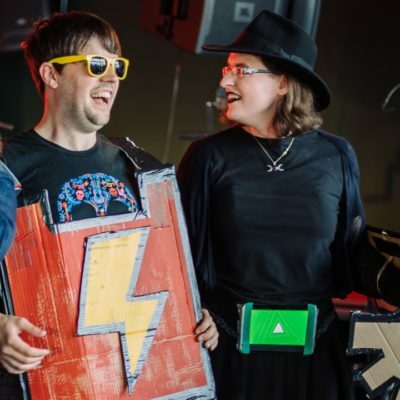 Created by game developer Alistair Aitcheson, The Incredible Playable Show is an interactive video game comedy show where you, the audience, take to the stage! Become human buttons, take on the Power Rangers, zap each other with barcode scanners, and play Pac-Man using inflatable toys. Or sit back, and watch your friends literally become cogs in a hilarious machine.